Bevo with sawn-off horns and a side of Red Raider. This was the groom’s cake at Jay and Morgan Behrens’ wedding, where my friend Tommy Evans of Specialty Sound was the DJ and MC. Bevo is branded with Jay’s initials and wearing an Aggie banner. For those outside the loop of Texas sports traditions, “Bevo” is the nickname for the UT Longhorns’ mascot, an actual longhorn steer. Many Texas A & M fans have T-shirts and bumper stickers that threaten to “Saw ’em Off,” referring to Bevo’s horns. College mascots now have bodyguards to prevent such shenanigans, but they can’t do much about cake bakers. 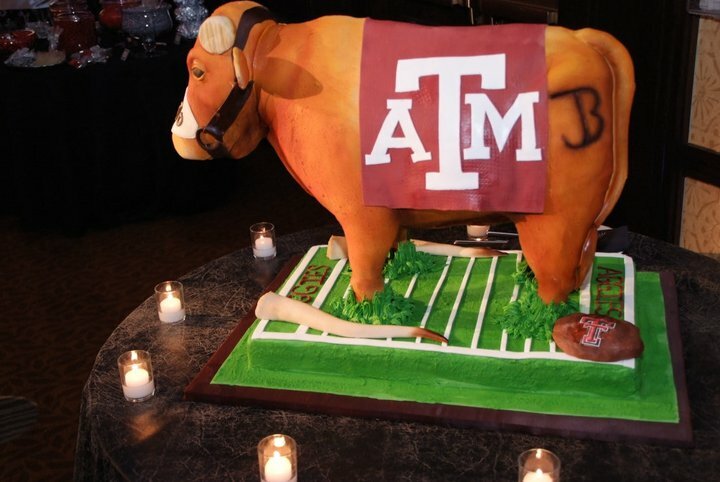 This entry was posted on January 9, 2011 at 3:22 pm and is filed under College Traditions, Let them eat cake!, Texas Aggie Weddings, Weddings!. You can follow any responses to this entry through the RSS 2.0 feed. You can leave a response, or trackback from your own site.